Sum Random Knowledge: Everybody needs a place to park. Everybody needs a place to park. This morning I saw something vaguely unusual, there were four police cars parked in front of the fountain at Bethesda Metro Station. 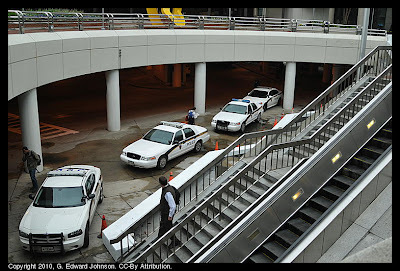 There didn't seem to be a burning emergency as they didn't have their lights on, there weren't any ambulances or fire trucks, and I could see three of the cops conversing near the top of the escalator. Twitter and the WMATA alerts are also quiet so I guess nothing big is going on. I wonder how long they will stay.